Most tiles have patterns in some form or another. Whether the design or pattern in the tile is crisp, clear, focused, blurry, repetitive, or singularly unique all comes down to the price we pay. When tiles look almost identical we lose some of the illusion of what we were going for with tile. If we wanted a marble look we want some of the characteristics of marble. When we look at stone looking tile we want that tile to vary just as much as stone but without the upkeep of a natural stone. When we look at Slate looking tiles we want the floor to have as much variation as slate. The ability to vary from one extreme to another. With woodlooking tile we want to give that appearance of wood. When the design and pattern in the tile looks that real it is an easy choice to make. What we would all like is when someone comes into our home that they are impressed with our home . We would like our friends to notice how realistic looking our new marble looking floor tile is. We would like them to be amazed at how realistic looking the porcelain tile is and how carefully the manufacturer has mimicked the stone. We want them to notice how realistic the grain and texture of the wood looking tile is to actual wood. We want our neighbors to look at our slate looking tile and be impressed with how smooth and even it is. The easy maintenance of tile is usually what makes us all look at tile initially. But when the tile pattern and design looks just as realistic as the real thing. That is what makes us choose tile over the real woods, laminates, marbles, granites, travertines, and limestones. The look and richness of natural products in the pattern and design but with the simple maintenance of a tile floor. This last few weeks we have been making small marble inserts for installations in hallways and bathrooms. The marble medallions still take most of our time, it is nice to make some smaller designs. We are working on developing a new display for the smaller marble inserts. The excitement level continues to build here at Designer Tile Plus. We recently became the Florida Tile Distributor for Southern Nevada. Florida Tile, Inc. is a world-class manufacturer and distributor of porcelain and ceramic wall tile, as well as natural stone and decorative glass and metal tiles. For over 50 years, Florida Tile has consistently taken the lead as an innovator by implementing new technology, delivering high quality products and protecting our indoor and outdoor environments. The corporate headquarters are located in beautiful Lexington, Kentucky. Products are manufactured and distributed from a state of the art facility in Lawrenceburg, Kentucky. Florida Tile found a perfect partner in 2006, when Panariagroup purchased the company. One of the leading Italian manufactures, Panariagroup is comprised of 8 brands with manufacturing in 3 countries. With a strong international presence, the brands are distributed in over 100 countries around the world. 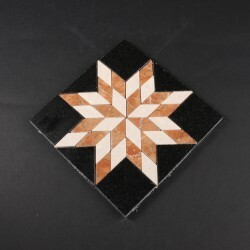 With Florida Tile and our Custom Marble Medallions and Marble Decorative Pieces we offer a beautiful custom look without the high custom prices.